Ochre means different things depending who you are talking to. We consider ochre to mean most generally, ‘mineral earth pigments with iron.’ In many historical cases, ochre may mean other things, such as “earth color made from rocks,’ ‘red earth,’ ‘yellow earth,’etc. All mineral pigments, including ochres, contain metal-based elements, known as transition metals, informing our experience of the color spectrum. In the case of ochres the primary metal element informing color is Fe, iron. Iron oxide ores typically used for pigment are: hematite, limonite, goethite, magnetite and maghemite. We also consider vivianite an iron-based ore to be considered among the ochres. Copper-based minerals (azurite, malachite), for example, are not ochres because their color is derived by the metallic element Cu, copper. Learn more about specific ochre-bearing minerals. Ochres and iron-rich earths are common, accessible, medicinal, inspiring and of deep origin. Human use of ochre, especially red and black irons, dates back at least 170,000 years in South Africa, at the dawn of humanity. We believe ochres –a wide range of iron-based clay, soil, rocks– grant us primordial access to key elements involved in the transformation of life. Studying iron-oxide on multivalent levels, and through visual use of color and color language, provides paths to learn more about these unique processes of evolution, transformation and aesthetic display. 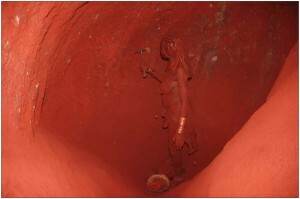 Unfortunately for archeologists, anthropologists and historians, ochre is an ambiguous term, especially when it comes to ‘red ochre.’ Often red colors documented in archeological records are identified as red ochre, but may include various other non-ochre mineral, plant, animal and human additions. Contemporarily ochres in field work means ‘color derived from iron oxides, hydroxides, etc,’ and in fact, most archeologists will discuss the color and the elemental analysis indicating what material the color is from. If an ochre earth pigment includes part manganese (Mn) we generally refer to those as umbers, as in ‘shade or shadow.’ Sienna’s traditionally have a higher Fe2O3 content. For certain pigments containing more silicate and other organic matter, they are called green earths. Lastly, iron-based shades of blue found in bogs, burial grounds and wastelands derived from the iron phosphate mineral vivianite, are less common and called blue ochres. That being said, umbers, siennas, green earth, blue ochre and ochres are all iron-based earth pigments. Or put more simply: ochres = iron earth pigments. WHAT IS AN EARTH PIGMENT? Stone, dirt, soil and rocks operate on geological time scales – meaning, they influence and work amongst larger elemental cycles (Nitrogen, Carbon, Phosphorus, etc.) in a ‘slow’ way. Many stones capable of producing colored pigment are millions of years old, created alongside gouges, folds and eruptive thrusts of Earth’s iron core. Some mineral pigments are only a few thousand, or a few hundred, years old, made through rapid mineralization of plants, animals, trees and synthetic chemical processes. The primary difference between commercial and wild pigments are repeatability and scale. In order to have a marketable pigment, commercial color supplies are mined from particular deep mines or sources. Then the material is mechanically ground, weighed, measured and combined in particular proportions, to generally create a repeatable, uniform pigment. Beyond uniformity, there must be enough sustained material to continue generating pigment that meets demand. Subtle wisdom and magic is lost in that process, but larger distribution and availability are gained. Repeatable color sacrifices particulars offered by each stone, but gives global access to mineral colors found in large supply only in particular parts of the world. Wild pigments showcase the integrated uniqueness of place. As well, it presents pigment and color in their natural context and teaches site-specific wisdom. For example: there are hardly ever pigment foraging sites where only a single color is to be found. The idea of a ‘palette’ is very much born of individual pigment foraging sites inherently producing combinations of color. There are certain groups of knowledge-keepers that are aware of localized mineral pigment deposits — though not all of them carry a knowledge of pigment production from these minerals. Geologists, hydrogeologists, and mineralogists (minerals), soil scientists (dirt/soil layers), miners (minerals and tailings) construction-foundation-ditch diggers (soil deposits), ceramicists (clay), and archeologists (historical sources) are the primary groups of people who carry aspects of wild pigment knowledge.